The BF75 is based on the same engine that powers one of the world’s most popular cars, the Honda Jazz. The BF75's 1.5L, SOHC, 16-valve, inline four-cylinder engine is inspired by the same remarkable engine that powers one of Honda's most popular motor vehicles, the Jazz.With the exception of the cylinder sleeves, these engines feature an all-aluminium alloy block, resulting in a very lightweight and powerful package.A range of Honda-exclusive technologies and power-to-weight ratios on par with that of two-stroke outboards result in best-in-class performance on all levels! Along with Honda's Programmed Fuel Injection, the BF75 incorporates Lean Burn Control technology, which allows combustion to operate on a leaner air/fuel ratio than stoichiometric air/fuel.An O2 sensor, together with the ECM, precisely controls the air/fuel mixture for the best fuel economy at cruise setting. The mode in which lean burn control is used during cruising to achieve higher fuel economy is referred to as ECOmo (Economy Controlled Motor). Alternators, ignition and other critical electrical components are mounted near the top of the powerhead to stay cool and dry.The starter motor is also inverted into a sealed chamber that protects the starter bendix drive from the elements.The major benefit of these features is simple: Dependability. 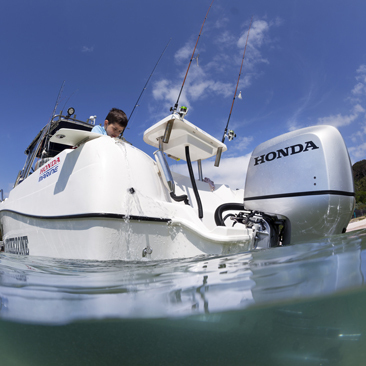 There's no risk of important engine components getting water damaged, or overheating, so you can spend your days relaxing on the water, without worrying about your engine. 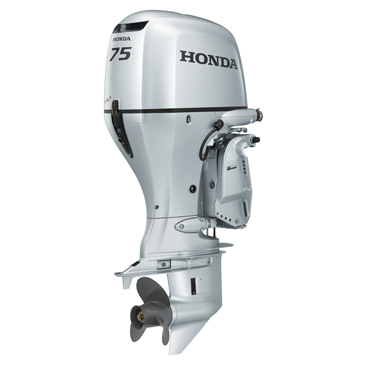 Designed to get you going faster, the BF75's gearcase reduces drag, eliminates hull porpoise and minimises spray, thus increasing acceleration and top speed.It also features a Torsion Dampener (sometimes called a flywheel),which is located near the base of the powerhead. This design lowers the centre of gravity for improved handling and hull manoeuvrability. And with a 3-position tiller handle adjustable to your comfort, operating the BF75 is truly simple.